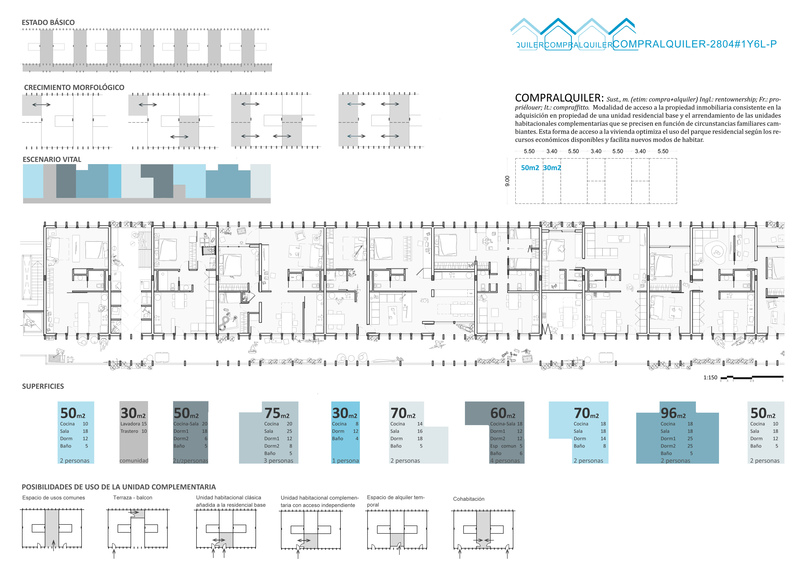 Diagram of basic system and possible inhabitation scenarios; and Floor Plan of a possible inhabitation scenario. Explanatory Diagrams and Elevational rendering. Own’NRent is a flexible housing system designed to enable the adaptation of dwellings to changing spatial needs throughout a lifetime. The system is premised on being able to ‘connect’ (and later ‘disconnect’, if necessary) two different types of spaces: 1.) a basic ‘Core Dwelling Unit’ (CDU) that is owned; and 2.) ‘Optional Ancillary Units’ (OAU) that can be rented and temporarily adjoined to a CDU. Dwellings can thus grow and shrink over time, depending on different needs and circumstances. As a household or a home business grows, extra space can be rented, if available. Conversely, if a household or a home business shrinks, rental leases on OAUs can be terminated, making that space available to either another neighbor or to the building community. The basic CDU is accessed via an outdoor, single-loaded ‘street-in-the-sky’ gallery, and contains a living-dining room in the front, a service core with bathroom and kitchen hook-ups in the middle, and a so-called ‘master’ bedroom in the back. OAUs on either side can be physically connected to CDUs for use as secondary bedroom, home-office, recreational space, or storage space by means of openings created in non-loadbearing, acoustically insulated separation walls between units. By transferring structural loads to the building’s exterior facades, openings between CDUs and OAUs can be situated wherever desirable (these openings would be closed and sealed again whenever an OAU lease is terminated). OAUs could also be rented out independently, as small business office space, in which case access would be via the communal gallery. 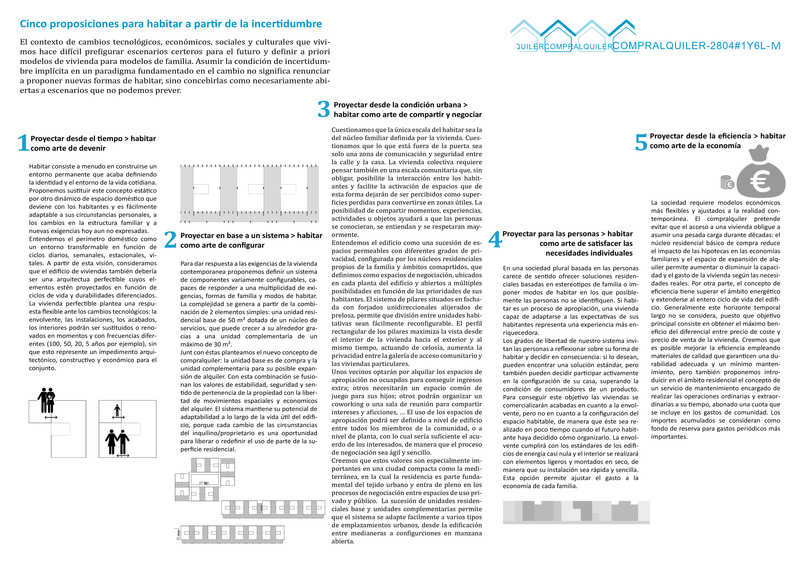 By enabling dwellings to expand and shrink by means of ancillary spaces that can be rented, this housing system is more dynamic, mixed-use, and responsive to changing domestic situations than most housing blocks. The great number of permutations and combinations of spaces means not only that very few units in the building would ever be alike, but also that the building’s interior would transform, not unlike life itself. 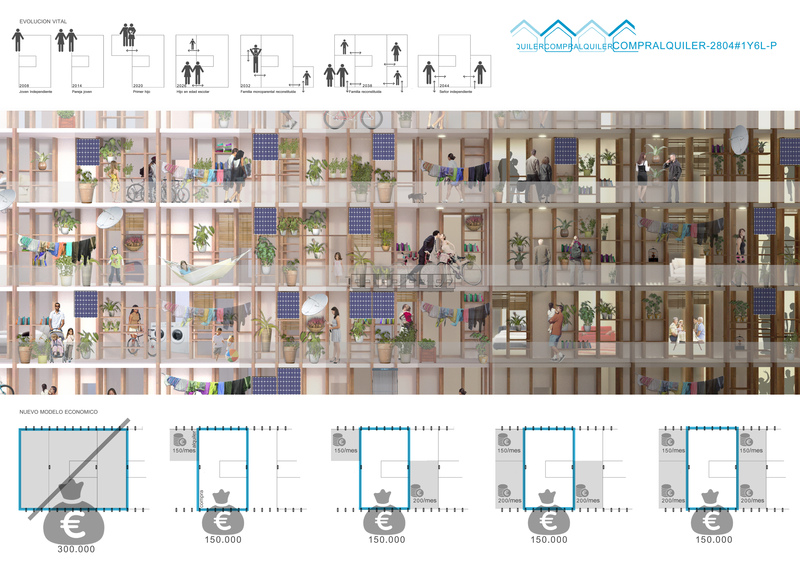 This project was submitted to the Solvia Housing Innovation Competition in 2014. Authors: Marc Binefa, Paolo Sustersic, Rafael Gómez-Moriana, Martín Sabbatini, and Mariana Telleria.